In this study, we report a new approach that allows dissection of distinct pathways regulating induction of early adaptive immunity in response to Mycobacterium tuberculosis (Mtb). We used traceable murine dendritic cells (DCs) and macrophage populations to chart their migratory pattern in response to Mtb, and found that only DCs receiving inflammatory stimuli from Mtb up-regulated their expression of CCR7 and migrated specifically to the draining lymph nodes (LNs). Furthermore, these Mtb-modulated DCs initiated a Th1 response only in the draining LNs. Taken together, these results demonstrate that Mtb-induced modulation of DCs is critical for their migration to regional LNs and ensuing T cell priming. Mycobacterium tuberculosis (Mtb)6 is a respiratory pathogen, and pulmonary infections are usually acquired through inhalation of aerosol-containing bacteria. Although the precise immune mechanisms engendering protection in the acute or latent phase of tuberculosis remain incompletely defined, current evidence supports the notion that effective acquired cellular immunity to Mtb is critically dependent on the host’s ability to initiate Th1 cellular responses (reviewed in Ref. 1). Despite this rich body of evidence signifying a central role for Th1 cells in mediating protection, little is understood regarding the APC types and the microenvironment essential for the initiation of early Th1 immunity in tuberculosis. A critical step in the clearance of a pulmonary infection is the power of the APC in the lung to migrate to the regional lymph nodes (LNs), where it can present Ag to naive T cells to initiate an adaptive immune response. There are many APC types present in the lung, of particular interest being the monocyte-derived tissue macrophage (Mac) and the CD11c+ dendritic cell (DC) that are present within the airway epithelia and the lung interstitium (2, 3, 4). However, there is growing evidence that airway DCs are the cells that migrate to draining LNs for T cell priming (5, 6, 7). With regards to Mtb, the pathogen is detected in the lung following infection in both Macs and DCs (8), and thus, following Ag inhalation, both cell types can potentially participate in the induction of adaptive Th1 cell immunity in the lung. However, the possibility that DCs might be the priming APC is supported by our previous work, where we showed that DCs infected in vitro with Mtb directed the development of naive Th cells toward the Th1 phenotype due to their potential to rapidly produce IL-12 in the presence of microbial stimuli alone. In contrast, infected Macs did not secrete IL-12 and consequently were not capable of supporting naive T cell development toward a Th1 phenotype (9). In this study, we therefore addressed two questions that are pertinent to induction of early immunity to Mtb. We first wanted to determine whether Macs or DCs, both of which can directly encounter Mtb in the lung, are responsible for carrying Ag to the regional LNs for naive T cell priming. Second, because interaction of Mtb with DCs leads to Th1 polarization in vitro, we also asked whether Mtb is able to modulate in vivo the innate Th2 priming environment of the pulmonary draining LNs (10, 11). Female BALB/c mice and breeding pairs of OVA peptide-specific DO11.10 TCR transgenic mice on the BALB/c background (12) were purchased from The Jackson Laboratory (Bar Harbor, ME). For these studies, the transgenic mice were bred and maintained under pathogen-free conditions in the Rodent Barrier Facility at Temple University School of Medicine (Philadelphia, PA). The virulent Mtb Erdman strain (Trudeau Institute, Saranac Lake, NY) was prepared as described previously (9). Irradiated H37Rv strain (Colorado State University, Fort Collins, CO) was inactivated by exposing the bacterial cell pellet to 2.4 megarads of ionizing gamma irradiation using a 137Cs source that kills Mtb while maintaining biological activity of the enzymes. DCs and Macs were prepared as described previously (9, 13). The cells were pulsed in vitro with irradiated Mtb (500 μg/ml) and/or 0.3 μM OVA peptide (aa 323–339) for 3 h. For migration experiments, DCs and Macs were labeled with the red fluorescent dye 5-(and-6)-(((4-chloromethyl)benzoyl)amino)tetramethyrhoamine (CMTMR) and the green fluorescent dye 5-chloromethyfluorescein diacetate (CMFDA), respectively, according to the protocol of the manufacturer (Molecular Probes, Eugene, OR). Briefly, cells were incubated with 10 μM CMTMR or CMFDA in serum-free RPMI 1640 for 30 min at 37°C. Cells were washed and resuspended in fresh PBS and incubated for an additional 30 min at 37°C. DCs and Macs (1 × 106 each) were then instilled intratracheally into the same mouse. Eighteen hours later, the lungs of all of the instilled mice were perfused with PBS containing 50 U/ml heparin, and the bronchoalveolar lavage (BAL) fluid was harvested. Lungs of the mice were also harvested, and single-cell suspensions were prepared by digesting the tissue with collagenase VII (Sigma-Aldrich, St. Louis, MO) at 750 U/ml at 37°C for 45 min. Draining mediastinal LNs (MLNs) and nondraining axillary LNs (ALNs) were harvested using a Leica (Deerfield, IL) MZ125 dissecting microscope with a Leica DC 200 camera attachment. Single-cell suspensions were prepared by digesting them with collagenase D (Roche, Indianapolis, IN) at 1 mg/ml at 37°C for 30 min. Single-cell preparations of the different tissues thus obtained were subjected to two-color flow-cytometric analysis to determine dispersion of cells to the lung and subsequent migration to LNs. Naive T cells were isolated from the spleens of DO11.10 transgenic mice using nylon wool column. Cells were labeled with 2 μM CFSE in PBS for 15 min at 37°C. The cells were washed, and 10 × 106 labeled cells in 200-μl volume were injected i.v. into the tail veins of BALB/c mice. Two days later, the mice were intratracheally instilled with Mtb Ag- and OVA peptide-pulsed DCs or Macs. On day 4 following intratracheal instillation, MLNs and ALNs were harvested, and single-cell suspensions were prepared. Cells were subjected to flow cytometry, and acquired data were analyzed using the Flow Cytometry Modeling software (MODFIT LT; Verity Software House, Topsham, ME). A total of 5 × 104 MLNs was restimulated in vitro using 1.5 × 105 irradiated spleen cells and 0.3 μM OVA peptide. Culture supernatant was collected 72 h later and analyzed for the presence of IFN-γ and IL-4 by ELISA (9). For statistical analysis of samples, a one-way ANOVA was performed (Prism, version 3.0; GraphPad Software, San Diego, CA). Values of p < 0.05 were considered significant. Previous work from our laboratory revealed that DCs and Macs exhibited different cytokine profiles following infection with Mtb, and this correlated with the type of Th immune response they were able to induce in vitro (9). These in vitro data prompted us to address the role of mycobacteria-bearing DCs and Macs in initiating early pulmonary immunity. To begin to appreciate the contribution of Mtb-infected DCs and Macs to naive T cell priming, we first examined expression of CCR7, a key chemokine receptor responsible for cellular trafficking to the LN (14), on the two cell types. RNase protection assay revealed that untreated DCs had low-level mRNA expression for CCR7, which was greatly enhanced following infection with the virulent Erdman strain of Mtb (Fig. 1⇓). Uninfected Macs expressed no detectable mRNA message for CCR7, and in contrast to infected DCs, the mRNA levels for CCR7 in infected Macs were extremely low (Fig. 1⇓). 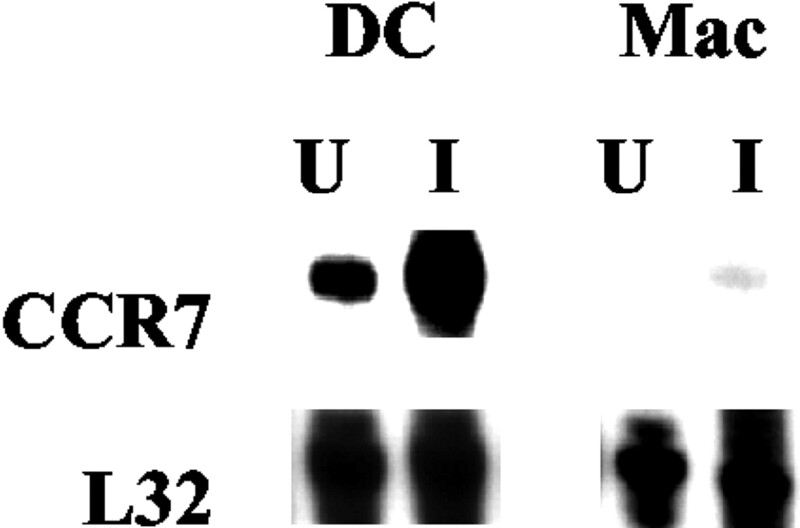 Similar differences in CCR7 up-regulation were observed between the two cell types in response to irradiated Mtb (data not shown), and therefore in subsequent experiments, irradiated Mtb was used. These results indicate that the trafficking pattern and consequently the ability to participate in naive T cell priming may differ between Mtb Ag-bearing respiratory DCs and Macs. Mtb induces CCR7 up-regulation in DCs. Bone marrow-derived DCs or Macs (2 × 106 cells/ml each) were infected with the Erdman strain of Mtb for 6 h (U, Uninfected; I, 1:3 multiplicity of infection of Mtb), following which the cells were harvested, and total RNA was extracted. RNase protection assay analysis was performed by hybridizing RNA to a BD PharMingen (San Diego, CA) custom template, which contained sequences for CCR7 and L32 (housekeeping gene). Data shown are representative of two independent experiments. To establish a causal link between CCR7 expression on DCs following Mtb uptake and their ability to migrate to regional LNs, migration of bone marrow-derived DCs and Macs was compared. We first investigated the localization of CMTMR-labeled DCs and CMFDA-labeled Macs in the same naive mouse following intratracheal instillation. 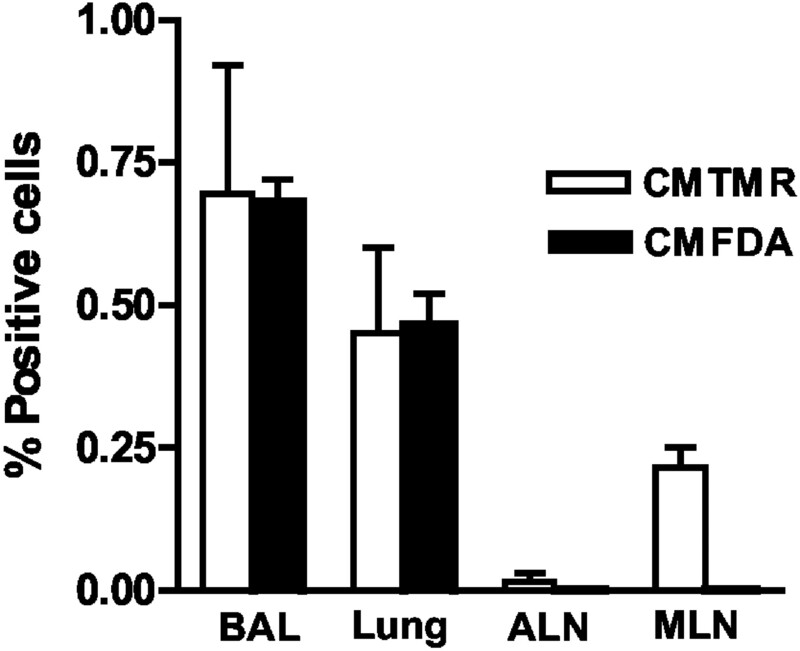 Two-color flow-cytometric analysis revealed the presence of DCs (CMTMR labeled) and Macs (CMFDA labeled) in equivalent amounts in both BAL and in the lungs following intratracheal instillation (Fig. 2⇓). These data indicate that both instilled DCs and Macs are present in the alveolar spaces, and in addition, both cell types also enter the lung parenchyma. We then studied the migration potential of the two cell types to local draining LNs. Examination of the MLNs at 18 h following instillation revealed only CMTMR+ cells and an absence of CMFDA+ cells (Fig. 2⇓). Presence of neither CMTMR- nor CMFDA-labeled cells was detected in the nondraining ALNs (Fig. 2⇓). These data indicate that preferential up-regulation of CCR7 following exposure to Mtb may possibly have conferred upon the DCs the capacity to migrate from the lung to the draining LN. Influx of DCs into the alveolar space at early stages of mycobacterial infection has been shown recently (15). However, our data do not distinguish whether DCs from the lung or the alveolar spaces actually traffic to the draining LNs. Future experiments will specifically address the migratory pattern of the DCs present in the two compartments. Migration of DCs and Macs. A, Bone marrow-derived DCs and Macs were exposed to irradiated Mtb for 3 h, following which the DCs were labeled with CMTMR, and the Macs were labeled with CMFDA. DCs and Macs (1 × 106 each) were then instilled into the trachea of the same mouse, and 18 h later, BAL, lungs, MLNs, and ALNs were harvested and single-cell suspensions were prepared. A total of 1 × 106 cells from each sample preparation was analyzed by two-colored flow cytometry for the presence of CMTMR+ and CMFDA+ cells. Data are expressed as percentage of positive cells in each tissue sample and are cumulative of three independent experiments. Having demonstrated that following Mtb exposure DCs, and not Macs, travel to the draining LNs, we next wanted to model the early events during naive T cell priming in response to pulmonary exposure to Mtb. We used a previously reported strategy that relies on adoptive transfer of Ag-pulsed cells and a cohort of labeled Ag-specific and naive transgenic T cells expressing a TCR of known MHC/peptide reactivity (16). The transgenic T cells that we used for these studies express a TCR-αβ specific for OVA peptide, aa 323–339 (12). Using this system, we followed the activation of the naive surrogate OVA-specific TCR-transgenic T cells by Mtb- and OVA peptide-pulsed DCs and Macs. Thus, by adopting a well-described mouse model system to our studies, we were able to come as close as possible to dissecting the early events involved in initiation of a pulmonary immune response to Mtb Ag. BALB/c mice were adoptively transferred with 10 × 106 DO11.10 transgenic T cells. Forty-eight hours later, the adoptively transferred mice were instilled intratracheally with either OVA-pulsed or Mtb- and OVA-pulsed DCs or Macs. On day 4, flow cytometry was used to follow cell division of the adoptively transferred CFSE-labeled, OVA-specific T cells in the MLNs and ALNs. In the MLNs, a subpopulation of the CFSE-labeled transgenic T cells had already undergone three cell divisions within 4 days of transfer of Mtb- and OVA-pulsed DCs (Fig. 3⇓A), with a total of 33% of the instilled cells having undergone ≥1 cell division (B). A similar high recruitment to cell division was not visualized in the MLNs if immunization was performed with DCs pulsed with OVA peptide alone (Fig. 3⇓A). In this group, only 10% of the instilled cells had undergone ≥1 cell division (Fig. 3⇓B), indicating that a low basal level of DCs may have migrated to the draining LNs even in the absence of any stimuli, akin to what has been reported in an earlier study (7). Furthermore, no appreciable cell division was observed in the MLNs of mice that had been immunized with Macs pulsed with Mtb and OVA peptide (Fig. 3⇓A). A quantitation of cell division revealed that only 11% of the transgenic T cells had undergone ≥1 cell division in this experimental group (Fig. 3⇓B), indicating that an analogous maturation and migration of Macs with subsequent activation of transgenic T cells had not occurred in this group. In addition, no division of the transgenic T cells was seen in the nondraining ALNs in all of the groups examined (Fig. 3⇓, A and B). These data indicate that Mtb-induced proinflammatory signal was necessary for maturing the DCs and greatly enhancing their migration to the draining LNs where they were then able to prime naive T cells. Local response of CFSE-labeled Tg-T cells after intratracheal instillation of Ag-pulsed DCs and Macs. A, BALB/c mice were adoptively transferred with transgenic-T cells 48 h before instillation with either 0.5 × 106 DCs pulsed with Mtb and OVA peptide, DCs pulsed with OVA peptide alone, or Macs pulsed with Mtb and OVA peptide. Four days later, MLNs and ALNs were harvested. Single-cell suspensions of MLNs and ALNs were gated for scatter characteristics. The cohort of adoptively transferred T cells was distinguished by strong green fluorescence of CFSE (x-axis). The acquired data were analyzed by MODFIT software. Cell division profile represented as generations (1, 2, 3) of the parent T cell population (P) in the MLNs can be visualized by sequential halving of CFSE fluorescent signal. The graph in A shows data analyzed from one representative experiment. B, Cumulative data from four individual experiments. C, A total of 5 × 104 of the MLNs obtained from each individual mouse was restimulated in vitro with OVA peptide (0.3 μM) and 1.5 × 105 irradiated spleen cells. Seventy-two hours later, supernatants were tested for IFN-γ and IL-4 protein levels by ELISA. To determine whether Mtb-modulated DCs had primed for a Th1 response, we restimulated the LN cells and examined 72-h supernatants for the presence of IFN-γ and IL-4. The differences in priming ability of the two APC types was further confirmed when T cells from the draining LNs of mice receiving Mtb-pulsed DCs secreted IFN-γ and minimal IL-4 (Fig. 3⇑C). In contrast, T cells from draining LNs obtained from mice instilled with Mtb-pulsed Macs did not produce detectable levels of either IFN-γ or IL-4 (Fig. 3⇑C), consistent with their failure to migrate to draining LNs. The inability of instilled Macs to prime naive T cells also excludes the possibility that priming was influenced by cross-presentation by endogenous DCs. This is noteworthy, because this approach can then be successfully used to study the priming ability of DCs lacking specific molecules, without interference from endogenous cells. Interestingly, restimulation of T cells obtained from mice that had been primed with DCs pulsed with OVA peptide alone produced low levels of both IFN-γ and IL-4. These data indicate that, in the absence of Mtb, the few DCs that do migrate to the LNs are able to prime; however, they are not capable of Th1 polarization, further confirming that Mtb imprints on the DCs a Th1-priming phenotype. In several experimental model systems, exposure to exogenous Ag administered either intranasally or by aersolization favors a Th2-type response. For example, Leishmania major, when delivered by several different routes to C57BL/6 mice, typically generates a Th1 immune response. However, intranasal delivery of the same pathogen results in a Th2-dominant response, further supporting the premise that the lung microenvironment favors the priming for a Th2 response (17). In contrast, we find that Mtb can modulate DCs to initiate Th1 immunity in the pulmonary draining LNs. These observed differences may be due to the fact that mycobacteria are unique in their ability to rapidly induce IL-12 production from DCs in the absence of any T cell-derived signals (9). IL-12 may provide the appropriate microenvironmental costimulation necessary to modulate the inherent Th2 polarity of the pulmonary LN environment toward a Th1-dominant response. Based on a recent study, which showed that LPS-induced down-regulation of airway Th2 responses is independent of IL-12 (18), it is possible that Mtb may also use other mechanisms to alter the Th2 environment in the lung. Overall, the salient findings from this study are as follows. Although both are present in the lung and capable of phagocytosing Mtb, it is the DC and not the Mac that migrates to the regional LN. Second, Mtb-modulated DCs initiate pulmonary Th1 immunity in the regional LNs. A caveat to studies described here is the extrapolation of data obtained with instilled DCs and Macs to their endogenous counterpart in the airways, and the fact that bone marrow-derived Macs probably behave considerably differently from alveolar Macs. However, we must emphasize that lung interstitial cells like the DCs used in these studies are also derived from bone marrow progenitors (19), and in addition, both the in vivo- and in vitro-differentiated DCs express similar cell surface markers, including CD11c and CD11b. In addition, DCs found in the alveolar spaces following an aerosol infection with Mtb also express CD11c and CD11b molecules on their cell surface (15). This caveat notwithstanding, the use of the phenotypically related bone marrow-derived DCs and Macs provides a valuable tool to dissect independently every step of the innate and early adaptive immune response to mycobacteria. This unique approach we describe will allow us to address in the future whether the function of nonmigratory Macs is to secrete appropriate chemokines for Th1 cell recruitment from the LNs into the lung, a necessity for initiating granulomatous responses. This experimental approach of tracking naive T cells will also provide a means to better elucidate the participation of the complex network of cytokines and chemokines to the migration of DCs in mycobacterial infections. In addition, it offers a method for wide-scale screening of potential vaccine strains of Mtb on DC maturation and subsequent impact on initiation of a pulmonary adaptive immune response. We thank Marc Monestier for the use of his dissecting microscope. Nita Thingalaya’s assistance with the intratracheal instillations is appreciated. The flow cytometry analyses were performed at The Wistar Institute (Philadephia, PA). We also thank John Chan for the Erdman strain of Mtb, and John Belisle for supply of irradiated Mtb through the Tuberculosis Research Materials and Vaccine Testing Contract (Colorado State University). ↵1 This work was supported by National Institutes of Health Grant AI055377. ↵2 K.B. and S.P.H. contributed equally to this work. ↵3 Current address: Department of Medicine, University of Medicine and Dentistry of New Jersey, Newark, NJ 07101. ↵4 Current address: Department of Medicine, University of Pennsylvania, Philadelphia, PA 19410. ↵6 Abbreviations used in this paper: Mtb, Mycobacterium tuberculosis; Mac, macrophage; DC, dendritic cell; CMTMR, 5-(and-6)-(((4-chloromethyl)benzoyl)amino)tetramethylrhodamine; CMFDA, 5-chloromethyfluorescein diacetate; BAL, bronchoalveolar lavage; LN, lymph node; MLN, mediastinal LN; ALN, axillary LN. Holt, P. G., M. A. Schon-Hegrad. 1987. Localization of T cells, macrophages and dendritic cells in rat respiratory tract tissue: implications for immune function studies. Immunology 62:349. Gong, J. L., K. M. McCarthy, J. Telford, T. Tamatani, M. Miyasaka, E. E. Schneeberger. 1992. Intraepithelial airway dendritic cells: a distinct subset of pulmonary dendritic cells obtained by microdissection. J. Exp. Med. 175:797. Sertl, K., T. Takemura, E. Tschachler, V. J. Ferrans, M. A. Kaliner, E. M. Shevach. 1986. Dendritic cells with antigen-presenting capability reside in airway epithelium, lung parenchyma, and visceral pleura. J. Exp. Med. 163:436. Vermaelen, K. Y., I. Carro-Muino, B. N. Lambrecht, R. A. Pauwels. 2001. Specific migratory dendritic cells rapidly transport antigen from the airways to the thoracic lymph nodes. J. Exp. Med. 193:51. Bozza, S., R. Gaziano, A. Spreca, A. Bacci, C. Montagnoli, P. di Francesco, L. Romani. 2002. Dendritic cells transport conidia and hyphae of Aspergillus fumigatus from the airways to the draining lymph nodes and initiate disparate Th responses to the fungus. J. Immunol. 168:1362. Legge, K. L., T. J. Braciale. 2003. Accelerated migration of respiratory dendritic cells to the regional lymph nodes is limited to the early phase of pulmonary infection. Immunity 18:265. Gonzalez-Juarrero, M., I. M. Orme. 2001. Characterization of murine lung dendritic cells infected with Mycobacterium tuberculosis. Infect. Immun. 69:1127. Hickman, S. P., J. Chan, P. Salgame. 2002. Mycobacterium tuberculosis induces differential cytokine production from dendritic cells and macrophages with divergent effects on naive T cell polarization. J. Immunol. 168:4636. Stumbles, P. A., J. A. Thomas, C. L. Pimm, P. T. Lee, T. J. Venaille, S. Proksch, P. G. Holt. 1998. Resting respiratory tract dendritic cells preferentially stimulate T helper cell type 2 (Th2) responses and require obligatory cytokine signals for induction of Th1 immunity. J. Exp. Med. 188:2019. Hsieh, C.-S., S. E. Macatonia, A. O’Garra, K. M. Murphy. 1995. T cell genetic background determined default T helper phenotype development in vitro. J. Exp. Med. 181:713. Willimann, K., D. F. Legler, M. Loetscher, R. S. Roos, M. B. Delgado, I. Clark-Lewis, M. Baggiolini, B. Moser. 1998. The chemokine SLC is expressed in T cell areas of lymph nodes and mucosal lymphoid tissues and attracts activated T cells via CCR7. Eur. J. Immunol. 28:2025. Gonzalez-Juarrero, M., T. S. Shim, A. Kipnis, A. P. Junqueira-Kipnis, I. M. Orme. 2003. Dynamics of macrophage cell populations during murine pulmonary tuberculosis. J. Immunol. 171:3128. Lambrecht, B. N., R. A. Pauwels, B. Fazekas de St. Groth. 2000. Induction of rapid T cell activation, division, and recirculation by intratracheal injection of dendritic cells in a TCR transgenic model. J. Immunol. 164:2937. Constant, S. L., K. S. Lee, K. Bottomly. 2000. Site of antigen delivery can influence T cell priming: pulmonary environment promotes preferential Th2-type differentiation. Eur. J. Immunol. 30:840. Kuipers, H., D. Hijdra, V. C. De Vries, H. Hammad, J. B. Prins, A. J. Coyle, H. C. Hoogsteden, B. N. Lambrecht. 2003. Lipopolysaccharide-induced suppression of airway Th2 responses does not require IL-12 production by dendritic cells. J. Immunol. 171:3645. Lipscomb, M. F., B. J. Masten. 2002. Dendritic cells: immune regulators in health and disease. Physiol. Rev. 82:97.